Montenegro is situated in the south of the Adriatic and is an extraordinary place. It offers an abundance of beauty, beaches, crystal clear lakes, the sea and incredible scenic mountains. In the mornings, you can wake up along the beautiful Adriatic coast, have lunch on the banks of Skadar Lake, and enjoy an evening walk in the Montenegrin mountains. Ulcinj is a historic old pirate city in Montenegro, and it has some fantastic restaurants, hotels and breathtaking views. Ulcinj is one of the last “hidden spots” in Europe for kitesurfing. Windguru doesn’t even show a realistic wind reading and people are almost unaware of this hidden gem on this rocky coast. People around here often believe that God forgot about Montenegro, but then he decided to give them one of his most beautiful lands in Europe! From May to September, you get a super steady thermic wind blowing almost daily from 12 knots to 25 knots from midday till sunset. Rain is sporadic and the air temperatures range between 30c to 35c while the water is between 25c to 30c in the summer. The spots are ideal for beginners and intermediate kitesurfers due to their broad beach, waist deep water, and the steady side-onshore wind. Due to the warm water, wetsuits are not necessary for the summer. A few kilometres downwind there is a river mouth with perfect flat water. All the freestylers among you will find the ideal conditions over there to improve your skills. During the winter, there isn't much kitesurfing going on, and snowkiting takes the lead! You can ride on hills, lakes, and mountains. The kite spots are on average 5km to 10km away from the main city Ulcinj. Taxis are available from the main road and cost about 8 Euros to get around. On the main road, there are a few little shops, supermarkets and restaurants as well. There is a huge, lovely wooden restaurant, with a beautiful view over the whole beach and the sunset at the camp on the beach. The prices for a pizza there is about 4€, draft beer 2,5€, octopus 12€, fresh Orada fish 12-15€, fresh shrimps 10-12€ and there is also a beach bar. During the week, you'll come across an open local market in town, where you can buy lots of fresh vegetables, fruits, fish, shrimps, local cheeses and Prsiuta ham. If you want to party, Ulcinj is the place to go! There are many bars, restaurants, and clubs! The area where the kite spots are located is generally pretty quiet unless the stations are hosting a get-together or bbq. I wouldn't even know where to begin; the options are endless! Standup paddleboarding is a very popular activity in this area. Safari Beach / Holywood also has a place for callisthenics and TRX, which is super cool. If laziness takes over, you can just lay down in our chill zone and relax with music and beer. If you are up for some excitement, you should visit cities like Budva, Kotor, and Bar, and experience the most beautiful landscapes! You'll find Wifi at most of the accommodation, restaurants, and pubs. There are many options when it comes to accommodations, from 4* hotels, mountain cottages with cable and free Wifi, wooden bungalows including toilets, showers, and kitchens, caravans for rents, to tents! The options are endless. Polish, extreme sports addicted. Snowboard instructor since over 10 years. Kite passionate since 2011. Made his IKO Instructor license in Dominican Republic 2014 and since then got stuck travelling and chasing the wind ;) Kiting in Poland, USA, Greece, couple of times on Zanzibar, teaching Bear Grylls in Mozambique and now running his own small school in Montenegro. Been to Ulcinj? What did you think? 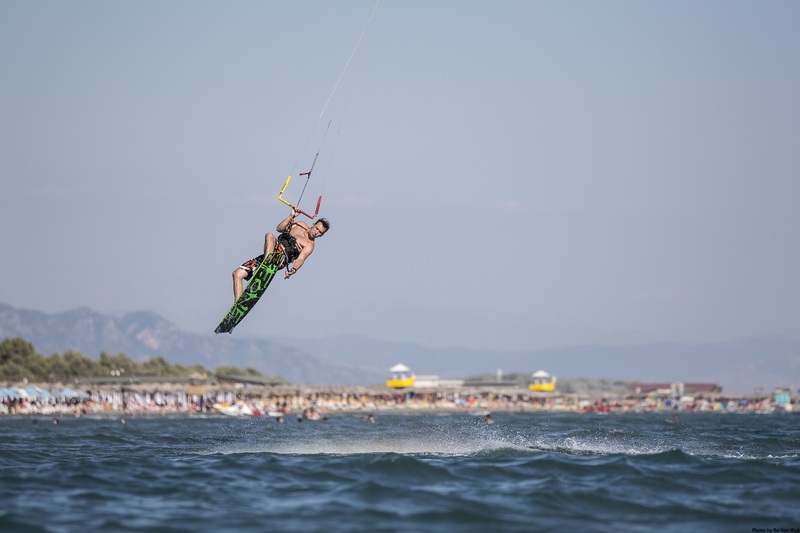 Where are the Best Kitesurfing Beaches in Ulcinj? This spot is a wide and long beach with a dark volcanic extra soft sand. There is nothing sharp around the beaches to worry about and as the old Montenegrins say, that this sand has healing properties! From this spot, you can do a (7km) downwind sessions, where you finish at the rivers delta, with flat water between two sandbanks. Once that is done, it's time for beer session in the local beach bar! When is the Best Time to go Kitesurfing in Ulcinj?